Paul Martin is joined by experts Michael Baggott and Will Axon at Coventry Cathedral. Paul takes a look at a set of six chairs that have been in one family for 101 years. meaning to ostracise, but where does it come from? The origin of the phrase, "Sent to Coventry", isn't known for sure. But it is thought to originate from the time of the English Civil War. where the Parliamentarian population refused to speak with them. Well, this crowd seem friendlier now. We've got the doors open. We're getting everybody inside. Completing the Flog It team sheet today are Michael Baggott and Will Axon. And first up, it's over to Michael. June, what a curious collection of different objects we have on the table today. -They used to belong to my mother, who was in business in Coventry from 1929. -And she died 30 years ago, sadly. And these are just some of the few things I've got left now. What business was your mother in? She was in new and second-hand furniture and china and glass. And also crocheted tablecloths. And she went to lots of auction sales. -Well, she had a wonderful eye. Let's start with this fellow here. And his use becomes apparent when we turn him round. He's obviously a nutcracker. It's a type you see in the 19th century. The wood... I've been thinking about this. I'm sure it's a fruit wood. -so it doesn't, even though it's got a few cracks, split when you use it and apply pressure. And I think that's supposed to be Punch. -Or a Punch-like figure in his little tricorne hat. -They term that as a frilled ruff. And it's a very amusing thing. -And it would have been carved in about 1850, 1860. They're quite collectable things and still useful. Then we've got a tortoiseshell box. And if we open it up - fantastic. You've got a little travelling scent bottle set. Beautiful hand-blown, faceted, glass vials. -It's English. And it's about 1765, 1770. It's a very early little travelling case. Normally they are a little bit more elaborate than this. You can get silver inlay. But it's still a lovely early thing. And this is a little papier mache snuff box. -And again that's got some great age to it. It's about 1810, 1820, when these things were fashionable. What's really interesting though is that you get all sorts of printed and applied scenes. This is a named view of Gibraltar. having that is really nice. -Any idea then of the individual values? -Well, Michael, I did think about £50 for the nutcracker. And the other one, well, again, I didn't think it was very good at all. I can feel myself reaching for my wallet as you speak. The nutcracker, these things are still under-rated. But they are lovely, hand-carved treen. -That's got to be £70 to £100 of anybody's money. -This little set, that's £100 to £150. -I think that that is a makeweight. as they're interesting individually and they'll complement one another. And if we put £200 to £300 on them as an estimate and put a reserve a little below that at 170. -And we hope that there are three fanatics for those items there and it does really well. -But thank you so much for bringing them in. Kathleen, good morning. What can you tell me about this infantry helmet you've brought in today? and it's just come from her house when we cleared it out. because you may remember that propaganda image of the German soldier in the Second World War. They were nearly always wearing these helmets or Pickelhaube, as they're known. And then the spike on top, which actually through the years has got shorter and shorter. When they first came out in the mid-19th century, these tended to be a lot taller. And occasionally you would also have plumes of horse hair on the top. They weren't originally invented for or designed by the Germans. They were, in the mid-19th century, designed by the King of Prussia. I notice from the badge at the front as well... On first inspection, it looked like the Prussian eagle. -..with a shield and holding a sword. The badge at the front usually gives you some idea of where they're from. It's usually the emblem of the city they're from. -Now, any ideas? Have you come across that emblem before? -Well, luckily, I did a bit of research. -shall I say, German lodger. -What can you tell me about him? -And your mother-in-law had him as a lodger? Maybe he ran off without paying the rent and he thought this would cover it. -Have you any idea of what its value is? -Someone once offered me £10 for it. -That sounds a little bit mean. -I thought that it was mean cos I'd seen them on programmes before. we've got issues with condition. You've got shrinkage cracking to the leather cover. I would say... Now, you say you were offered £10 for it at some stage. -I think you could probably put a nought on that. -I would think it's worth about £100. -..estimate? You've seen this programme before! -So 80 to 120. And let's reserve it at that bottom figure. Can we give the auctioneer some discretion? -But hopefully we won't need it. But I shall see you there. Kathleen, it's so nice to see a good, honest set of chairs ready to go to the kitchen. -They're lovely. A set of six. -We often get the odd chair. Or we get a pair of hall chairs. But this is a good set of six chairs. So what's the story? Where did they come from? -My auntie bought them for my mum and dad when they got married. That's 101 years ago. -So these have been in the family for 101 years? -So you used these in the kitchen as a little girl? -Sat on all of them probably? This one's had a little bit of a bash up there. It's been cut. But it's very, very smooth. -Yes, my mum did that. -What did your mum do? What happened? -I think I was 15 months and I put my head through it. -You got your head stuck in there? -Skimmed a bit off there? -What a lovely story. They are fantastic. which is a great wood. Look at the grain. It's so ambiguous. It never runs in one direction. And it's called the wood that never sleeps, so it's always moving. When you sit on them, it gives with you. -They're normally called a blade-back. You can see they're sort of shaped like a blade there. -had practical functional chairs like this. -They were made in their thousands. and they fetch around about £15 a chair, £20 a chair. But with a set of six, I think there's a premium on that. -And I think we could get over £200 for a set of six. -We'll put a reserve of £150 on. -I think it's a great set. And somebody's going to inherit your love that you gave these. It's a shame to have them and not use them, you know. None of the family want them. That's sad. I think there's another 100 years left in them. I'd like to think so. Yes. Valerie, thank you for bringing this lovely gentleman's watch in. May I ask where you got it from? It belonged to my father's father, so that's my grandfather. -It's been in the family quite some time. Do you know roughly when it was made? From the outside, I'd say it's not an English watch. It's likely to be French or Swiss. But we'll have a little look, pop it open. That's very nice. You've got a lovely gold dial with black Arabic numerals to it. And we've got some marks there which tell me that the case is Swiss. and scrolls on this machine-turned ground. Quite exquisite. And that's probably going to be quite standard. And there's the standard Swiss cylinder movement. -It's lovely and thin. It was made for elegance. But really if you see how thin that dust cover is, it's more for show than substance. It would've been made around 1890, anywhere up to about 1910. And it's that typical, showy, Swiss gold engraving that they did terribly well. And why have you decided to part with it now? It's to de-clutter. I never look at it. I never use it. -It might as well go to somebody who'll appreciate it. Unfortunately, I've given this a little shake and there's no ticking. So it's not in working order which will make a slight difference to the value. -But any idea of what it's worth? In running order, it would be about £120 to £180. But you've got to take into account someone's going to have to overhaul the movement and do repairs to it. So I think at auction we should be putting that in at 80 to 120. We'll put a fixed reserve of £80 on it. And hopefully a watch repairer will fall in love with the case and not mind about the movement. -But are you happy to put that into auction? -So we'll pop it into the sale for you and hope it does really well. We'll be back for more valuations later. Now let's see what our first lots will make at auction. And here's a reminder of what we're taking. First was June with a trio of trinkets for Michael to value. Will they combine to create a great price? Kathleen brought in a German helmet which Will took a look at. It's not in mint condition. But these items are very collectable. Next up was another Kathleen, whose set of six chairs have been in the family for 101 years. who looked at Valerie's gold watch, Swiss, beautifully decorated, guaranteed to go, you'd think. But nothing's certain in the saleroom. Today's auction is in Bigwood. Not that big wood, but this Bigwood. Bigwood Fine Art Auctioneers is in Tiddington, just outside Stratford-upon-Avon. The big names here are auctioneers Chris Ironmonger and Stephen Kaye. The sale is about to begin, so time to find out if Michael and Will's valuations strike the right note. You certainly wouldn't want to sit down on this lot if somebody left it on a chair, would you, Kathleen? -We've got a German Pickelhaube helmet with a big spike on the top. -Yes, it was just a bit misshapen, I think. -It had a bit of cracking on that leather cover. -So how did you come by this anyway? I thought that my mother-in-law used to have a German lodger. -But my friend who's here says he doesn't remember it. -The mystery deepens about this German lodger. We go to Lot 415, which is the Pickelhaube helmet. -I've got some bids here on the book. I can start here at £80. 95. 100. And 10. 120. 130. 140. 150. 190. I'm out. Anybody give me 200? -Yes! The hammer's gone down. £190. -Bit of a "come and buy me". -A little bit. It was just the condition. -But it was nice and original. -It's a lovely thing. Don't forget there's commission to pay. There's a bit of spending money. -Unless the German lodger's watching and asks you for his cash back. Good luck. Valerie's little gold watch is just about to go under the hammer. It's Swiss, 14-carat. -Where can you buy a Swiss, 14-carat gold pocket watch for £80? -Well, you can't. But hopefully we'll sell it for 200. Good luck. Hopefully, we'll get the top end of the estimate. It's going under the hammer right now. Lot number 100 is the gentleman's hunter cased pocket watch. And I can start here on the book at £75. Good, we're in, in the room. -140 with the gentleman at the back. -Well, you're happy. The chap that bought it is smiling. So it's a win-win situation. -Valerie's shopping later, so she'll be happy as well. Good luck. I've got 40 here. 45. 50. 55, madam? 55. 60. We've got Kathleen's six chairs just about to go under the hammer. I hope we get you top money today. They're just about to go under the hammer. This is it now. Good luck. Lot 535 - six late 19th, early 20th-century Windsor kitchen chairs. Good solid little chairs there. And I'm bid £100. 110. 120. 140. 150, if you like? For a set of six, they're no money at all at 140. Do you want 150 now? At £140. Are you all sure? All done. -I don't know if he's sold. -150 was the reserve, wasn't it? -I don't want to take them back. and see if the auctioneer can let them go to him at 140. -June, £200 to £300 riding on a nice little lot, isn't it? -And a bit of this and that. -It's the most fascinating little lot. -A collector will love these. -You'll just muse over them. There's lots of fascinating stories. Your mum had a good eye. -Anyway, we're going to flog them. They're going under the hammer now. and also the German nutcracker and seal box. 100 for this? Get me started at 100? I'm bid 80. It's a bit of a low start there. 180, is it? It's 170 in the far corner. At 170. At 170, I'm going to sell it. Make no mistake. In the far corner at 170. -And someone will really enjoy that lot as well. -The nutcrackers in it were fantastic. -I wanted to get them. I couldn't. But just to polish them. -Because once you put a bit of wax on them, they'll just spring to life. -Thank you for looking after me. -You couldn't be the only one to get a kiss, Paul. Before we go back to Coventry, I'll take a trip to a picturesque village just down the road in the Cotswolds. It's home to a museum I've been wanting to visit for a long time. and influential designers of the 20th century. He was a very passionate and talented draughtsman. And he had a profound impact on the development of modern furniture and how we relate to design today. And his name was Sir Gordon Russell. This was his original workshop. It's now a wonderful museum dedicated to his lifetime achievements. And it houses the most fabulous collection of furniture designed and championed by him. Gordon Russell's furniture and designs tell the story of his life. A life that went through distinct and often contrasting phases. and that was to design, conceive and construct well-made furniture. In his own words, "decent furniture for ordinary people". And that would become his mantra. and how a family move would influence the rest of his life. The museum's here in the village of Broadway in the Cotswolds. And it was to this very building that the Russell family moved when Gordon was a 12-year-old boy. Russell became a weekly boarder at Chipping Campden School. And it was there that he got fascinated by local craftsmen and what they made. He got a first-hand experience of an artistic and social movement, Arts and Crafts. The Arts and Crafts Movement originated towards the end of the 19th century. Its focus was on hand crafts and it celebrated the workmanship of design and production. It was about simplicity and honesty, taking pleasure from construction as much as the end product. The Movement opposed mass production, machine manufacturing and industrialisation. When Russell was growing up in the Cotswolds, it was the very centre of the Arts and Crafts Movement. This was to have a profound influence on Russell's entire life's work. This has got to be my favourite piece in the museum. because it won an award in 1925 at the Paris International Design Fair. He really was at the top of his genre and this is so unashamedly Arts and Crafts. And he's not frightened to show it. It's very subtle as well and quite masculine. because if you look here, you can see some very fine hand-cut dovetails. but what I really love is... he's done it here, look at that! He's put the construction right through the architecturally important piece. That's so Arts and Crafts. They're not ashamed to show how this is put together. Each joint is hand-cut. It's unbelievable. This inlay is stunning as well. That's all hand-cut by chisel and inlaid in. You've got ebonies, boxwoods, yew woods. It's very decorative. to use as a template for the inlay. He's copied it absolutely beautifully. The more you look at this, the more detail you can see. On the stand, you see these lovely octagonal legs. Look at these bog oak-inlaid chevrons moving all around the leg. That really is a joy to behold, that piece. he was also realistic about the cost of his designs and how it limited their mass appeal. He wanted everybody to enjoy his furniture and his design. something that wholly opposed his Arts and Crafts roots. But it didn't deter him though. Russell believed that the machine could be tamed and taught manners and work in harmony with Man. and was in the most productive design phase of his life. However, a downturn in the global economy threatened the business. A chance phone call would change his fortunes for ever. It was from an Irish radio engineer called Frank Murphy. and Gordon Russell responded immediately. Here are a few of the designs. Look at these lovely radios! It's no wonder they were an instant success and they moved the company into a new phase of prosperity. The radios showed that there was a market for modern, well-built furnishings. whilst preserving the design principles the firm was built on. Gordon Russell stepped back from its management and suddenly and completely stopped designing. but little did he know that events on a global scale were about to set his life off on a different course. 'This is London. You will now hear a statement by the Prime Minister. With the outbreak of World War Two, there was a sudden and profound need for general use furniture. What was needed was simple, functional, well-built furniture that could be mass-produced. overseeing the design and manufacture of utility furniture. to produce decent furniture for ordinary people. And here's an example, a classic piece of Second World War utility furniture. Granted, it doesn't look as pretty as the other pieces, but it's practical, it's very functional. so definitely built to last. It is austere, but it's got an understated beauty. Russell's role working on utility furniture led to other management positions in the design community. from public life back to his beloved Cotswolds. At the ripe old age of 84, Gordon Russell's life came full circle. He started to put pen to paper and design again. and what inspired him most was the Arts and Crafts Movement. This little yew wood occasional table is one of the last things he designed and it was done in 1979. Sadly, three years later, he died. But what a wonderful legacy he's left! Incredible. Welcome back to the valuation day at Coventry Cathedral. Still people are pouring in. Everyone who comes to one of our events is guaranteed a valuation, so we should be here for a while. but for me it's a nice change because I specialise in furniture. -It's my grandma's and it sat in her hallway for as many years as I can remember. Has she got any other bits that are similar dotted around the house? No, this is the only piece. so there would have been a couple of single chairs, a couple of armchairs and this settee. -Any idea of how old it is? I would think you're looking at late 19th century, early Edwardian. -Of its type, it's actually a nice one. There's a nice bit of carving on the back here. We've got these acanthus scrolls that are carved in. It shows a bit of quality in the manufacture, shall we say? Have you ever been tempted to put it into your home? No, never. It's quite sad cos it's just sat there all these years. Nothing's been done with it. That's the trouble with these. How do they fit into the modern home? They're not exactly primary seating any more. so they're a little bit formal and upright for today's living. Have you thought about how much it's worth? No, it's just sat there. I haven't given it a thought at all. but of its type, it's got just enough detail that just helps lift it up from the norm. which again was that sort of Georgian revival of the scrolling acanthus. And that's nicely echoed again in the arm supports. than one that's just thrown together without any carving and so on. So, value-wise, I'm thinking of about 100, that sort of level, 150. -Would you be happy with that sort of money? -Yeah, I'd have thought so. -You want a reserve of 100? -You want it back if it doesn't sell? -No, put a reserve on it. -You want a reserve on it, but you don't want it back! -We'll put £100 on it with discretion. How's that? -Hopefully, on the day, we'll get it away and someone else can enjoy it. -Shall we see if it's comfy? I don't think I've ever seen a dog with such a surprised expression before. What have you done to him? -It must've been all the tugging around as a child. -So he was yours as a little girl? -Did he follow you everywhere? -He did when I was learning to walk. -It was more my own dog. -Where has he been living the past few years? -The past few years, he's been in my mum's cupboard. -Oh, dear. It's no place for a lad like that. -Even with that... Oh, dear me. ..with that expression. -Do you know when and where he was made? -I think Germany. When I was a child, my father was in the forces. but in Germany at the time, they didn't have any, so she bought me this for Christmas instead. So it was the Alsatian or the German shepherd on wheels? -You have to look in the ears of these things, especially when you say "Germany". And sure enough, we've got the little Steiff button. If you need reaffirming that it's all genuine, all of the wheels are marked "Steiff" as well. And I think it was probably new or slightly second-hand when you had it. It's certainly a dog that would have been produced from 1950 up until the late '60s. -It's a bit of fun. This ring does something, doesn't it? -It wouldn't be terribly good as a security dog. If you heard that, you'd be encouraged, not put off. -The all-important buttoned ear has had a little bit of restoration done to it. -Because it's actually on the wrong way round. Any idea of what it's worth? -I haven't at all, no. It's not a fortune, unfortunately. Had it been 50 years earlier, it might have been a small fortune. -But as it is now, I think at auction, it's £50 to £100. -and it will find a good home. Are you happy to sell him now? Get him out of the cupboard, give him a new lease of life? Let's hope he doesn't bark too loudly and put everybody off! -Thanks for bringing him in. Christine, what a menagerie you've brought in for us today! Has this come out of a love of all things animal or are you particularly interested in Beswick? -Well, we've just got interested in collecting them over the years, you know. -Have you bought most of these from fairs or sales? -No, from Coventry shops, like, you know. We've seen a lot of Beswick on the programme, Flog It. There's only so much you can say about it. -It was established sort of late 19th century. that were at the top end of the market, shall we say, the Doulton and Worcester figures. though some models were limited and rarer than others. -Exactly. As special editions or such like and they can command good prices even today. I've had a quick look over what you've brought in and I'm not pretending to be a Beswick expert. It's not really my field, but a lot of these I have seen before. You've got the bird figures which we've seen before, the foxes are quite common. The dogs again are quite a popular series of Beswick. -This chap here's not Beswick, but he's sneaked in. But why not keep him with the others? Then these are rather later, these more matt finishes. The market for Beswick is not as strong as it has been. -I don't want to go over the top on the valuation. -Let's put a sensible figure on them. I'm thinking of putting a figure on these, as a group, as one lot. -The more in the lot, the more interest it's gonna generate. I'm thinking of putting £200 on for the lot. -That may not sound a lot. -I think they'd be worth more than that. saying, "That's a rare example, it's worth £100 on its own!" I hope that's true. Let's reserve them at 200 to make sure they don't make any less. -No, otherwise it wouldn't be worth selling them. -We'll put 200 fixed reserve on them. -Hopefully, the money will go towards collecting something else now? -No, towards a new carpet. -What's happened to the old one? -At least we know it's going for a good cause. We're going for a new carpet for Christine and we're using the Beswick to raise the cash. -£200 minimum, but we hope for more. -We'll see you on the day, Christine. That's all from Coventry's splendid cathedral. Here's a reminder of what's going under the hammer at the auction. Will and Tracy might be getting comfy on her Edwardian-style sofa, but will the price put her at ease? but that Steiff name alone should warrant some interest. And finally, Will took a look at Christine's Beswick zoo - quality and quantity! Let's hope someone has an ark on stand-by to take this lot home. Things are moving along nicely. You could say so far, so good. -Do you like my gag? -Took me a long time to think of that! It's a cracking little seat. If you want a good seat to sit on for £150, that's a bargain. -I chuck mine on the floor. -I'm from the same school as you two! -Good luck. 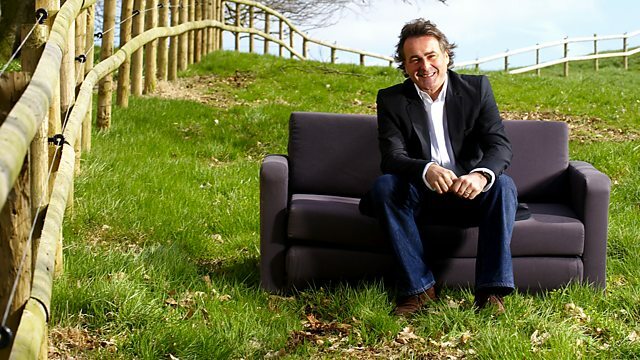 Here's the sofa going under the hammer. Lot 520 is a Victorian, Edwardian mahogany parlour settee. -I can start this off at £100 with a bid on the book. 110. I'm clear. 120 anywhere else? At 110. 120. 130. 140, sir? -It's the room against the commission bidder. -Great. Good. Mid-estimate. Are you happy with that? -What will you do with 130 quid? Bit of commission to pay. -It'll all go towards Grandma's care. -So, to look after her? -Barbara, I hope you're watching this, and good luck. -Good luck to you as well. -Thank you. I was pleased with that. -It belongs to Linda and he's a good pedigree, isn't he? Will you be sad to say goodbye because you've used this little doggie as a walking aid? I did. He was lovely to grow up with, but he's been in a cupboard for 30-odd years. -A bit of daylight might do him a bit of good. -As breeds go, he is "best in show". -Top name. The bark almost went on valuation day, but we got it back. We did a bit of resuscitation and for £50, it's a piece of Steiff, isn't it? Lot 470, this is a pull-along Steiff dog. 50 quid for the dog? Thank you. Anybody give me another fiver? Thank you. And 60? -And 70? 65 at the very, very back. Anybody give me 70? Are we all done...? -And hopefully, it's gonna go to someone who is gonna learn to walk with it. Next up, we have a Beswick zoo for sale. Not quite, but it is 31 animals which have been split into a dozen or so lots. They belong to Christine. Let's find out what it's all about. OK, were you a big collector? -Well, my husband started collecting them. -You bought one or two every year and built up a collection? -Why are you selling now? -I want a new carpet for my living room. That's a fair exchange. I'd swap my Beswick for a carpet! I'd swap my Beswick for a rug! Let's hope it doesn't get pulled under our feet today. -They have been divided up into lots of different lots. Some figures are more collectable than others. but the auctioneer knows his market and decided to split it up into smaller lots. -Let's start off with the first lot. It's a Dalmatian followed by a fox. Ready? That's £30. The next is a collection of animals. And 307, some more Beswick - the mouse, the donkey, etcetera. I've got 35 on my right. At £35, I'm gonna sell it. -Yes! And now we've got an eagle. Let's watch this one fly! Starting at 30 on the book. 5 in the room? 35. At 35. It's yours, sir. 309, we've got the Spirit of Fire this time, the grey horse. I've got 30 here. 32. 34. Any advance on 34...? -Now the horse, the palomino. 55. 60. 65. 67. Any advance on 67...? Yes! We've got some birds. With me on the book at 50. 60. 60. And I'm clear. -I meant to bring a toby jug! The kestrel, the song thrush and an owl. 70 with you, sir. -5, anywhere? £70, thank you. We've got the stag family. -So far, so good. We've got a woodpecker, a kingfisher. 85. 90? 85 it is. By the door here at £85. Going at 85. All finished and done...? That's the last lot gone. That's brilliant. -The collectors were really here today. -Just over 500 quid. That's fantastic. -Thank you so much for bringing them all in. Sadly, we're coming to the end of another show, but what a fantastic day we've had here! Everybody has gone home happy and all credit to our experts. We've had a wonderful time at Coventry Cathedral and at Bigwoods we've been well looked after. I can't wait to come back. I hope you've enjoyed today's show. Until next time, cheerio. Coventry Cathedral is the grand setting where Paul Martin is joined by experts Michael Baggott and Will Axon. Paul takes a look at a set of six chairs that have been in one family for 101 years, Michael meets a Steiff toy dog whose bark is just as harmless as its bite, and Will is confronted by an entire zoo's worth of Beswick figurines. Away from the valuations, Paul gets the chance to study the original drawings of one of the most important and influential designers of the 20th century, Sir Gordon Russell.